When you try to work in a poor power environment, it is no surprise that you find yourself frustrated and stressed trying to figure out what to do. You know you need clean power to operate your equipment, but what are you supposed to use? Cleaning your power source is often easier said than done, except when you use DSS Rack/Tower UPS from Smart Power Systems. 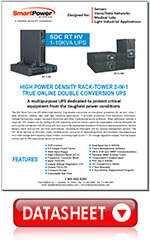 Smart Power Systems offers a unique, uninterruptible power supply that provides an unmatched level of power and protection to your servers. With our DDS-RT-TBF, you are able to get the correct amount of power no matter the environment in which you are working. This UPS system is the first of its kind, offering you a power source through a Transformer-Based Filter, and giving you the functionality of an electric power conditioner. Besides its backup voltage capabilities, this DDS-RT-TBF also works to eliminate the disruptive line noise at the lowest let-through levels. As an interactive LCD interface, this UPS system gives its users access to useful information regarding its operating mode, detailed site-power data, and a variety of different setup and configuration options including a power off emergency interface and replaceable batteries. Using our highly advanced UPSwing™ software, you are able to proactively monitor your entire operating system, making your power protection simple. Gain the power you need and the protection you desire. 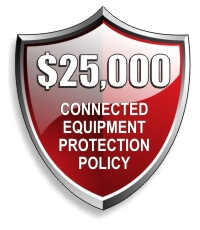 Your business is safe with Smart Power Systems. Contact us today regarding your DDS-RT-TBF system or with any questions that you may have.